The Mission Bay Parks System is home to an abundance of wildlife, particularly along the riparian zones of the Mission Creek shoreline. In this area, park visitors can spot a wealth of birds and other animals that thrive in the nutrient rich mud and bay waters. Mission Creek is linked directly to the San Francisco Bay. The tides flow in twice a day. Many of the animals that live in the San Francisco Bay venture up Mission Creek to visit the calm, nutrient rich waters. The Mission Creek Conservancy, a 501(c)(3) organization spearheaded by local residents, is dedicated to preserving and enhancing the tidal community at Mission Creek. One of the best locations for wildlife viewing in Mission Creek Park is the 5th Street Overlook, which can be reached from Berry and 5th Streets. Park Management does not allow direct pedestrian or dog access on the shorelines to protect the wildlife in the Creek and ensure the safety of park visitors by keeping them off of the slippery rip rap. From the 5th Street Overlook, park visitors may notice ripples in the water. Just beneath the surface, there are often schools of fish swimming. There may even be a cormorant or sea lion in pursuit! A wide array of sea creatures can be spotted swimming in Mission Creek, including California sea lions, bat rays, schools of anchovies, sardines, herring, and shiner surfperch, and Dungeness crab. This makes Mission Creek prime fishing area for many birds, and thus a great place to bird watch. Mission Creek is home to a thriving community of birds and a favored urban location for local bird watchers. Bird watchers can look for pelicans, great blue herons, western grebes, buffleheads, bushtits, black-crowned night herons, hummingbirds, white-crowned sparrows, American robins, northern mockingbirds, snowy egrets, double-crested cormorants, and many more species. Incredibly, this bountiful community of birds can be found in the heart of a formerly industrial zone of San Francisco! 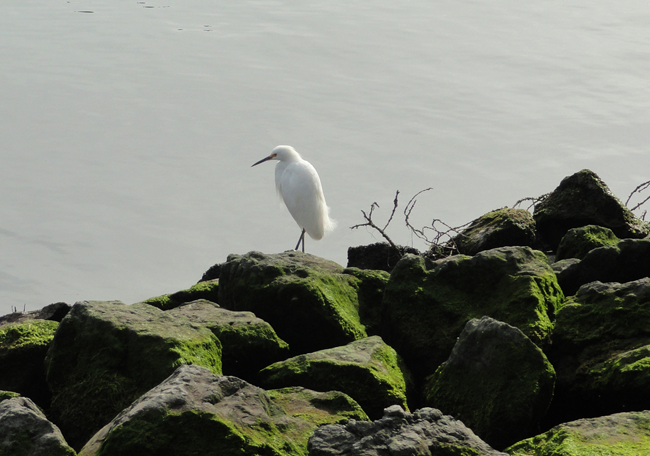 The snowy egret, a small white heron, can often be spotted along the rip rap and pilings on the Mission Creek shoreline. In the past, this bird’s beautiful plumes were used in women’s hats and overhunting led to dangerously low population levels. The population has since recovered now that the snowy egret is protected under the United States Migratory Bird Treaty Act. Park visitors will easily recognize the snowy egret. Typically 24 inches in stature, this radiant white bird has a slim black bill and long black legs with yellow feet. These birds eat mostly aquatic fare, including fish, frogs, worms, crustaceans, and insects. Snowy egrets like to stalk their prey in shallow, tidal waters, making Mission Creek Park a perfect location for them. One of the most distinctive birds to call Mission Creek home is the double-crested Cormorant. This relative of frigate birds and boobies is a black fishing bird. Upon closer inspection, these birds display some spectacularly colored details. They have yellow-orange skin on their face and throats, aquamarine eyes, and a bright blue interior mouth. Cormorants are built to fish. They have solid, heavy bones which help to build momentum on dives to catch small fish. Their feathers have less preen oil than other birds, which makes it easier for cormorants to glide underwater with extreme speed and agility when seeking their prey. Unlike ducks and other water fowl, their feathers soak up water rather than shedding it. As a result, cormorants can frequently be spotted along the pilings and shoreline of Mission Creek with their wings spread out in the sun to dry. Come on out to Mission Bay Parks to share this hidden gem in San Francisco with all of the wildlife that thrives here everyday. The parks are open sunrise to 10pm everyday. And there’s no better place to see all that the SF Bay has to offer. Do you bird watch in Mission Bay Parks? Share your experience. We look forward to hearing from you!